Last Sunday was the first ever Graystone Serves and from the feedback I have received, it probably will not be our last. An estimated 580 Graystoners were the hands and feet of Jesus in our community. Our army of volunteers was able to accomplish around 25 community service projects. We have received several thank you notes and encouraging emails. I have copied and pasted one to the bottom of this post. We were able to clean up and landscapes 4 yards of those who couldn’t do it themselves. We took care packages to 4 local police stations and 5 fire stations. Over 100 folks including kids helped clean up Tribble Mill Park. 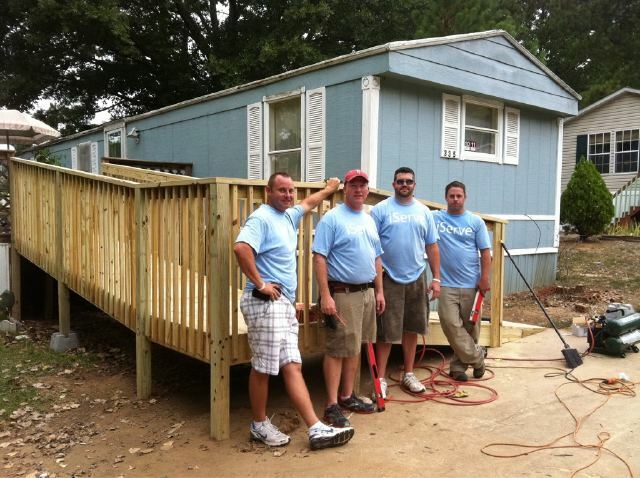 We tackled various projects at Gwinnett Estates (Hope Center) including building a wheelchair ramp. We donated over 2000 food items to the Southeast Gwinnett Co-op. We also helped stack their selves and worked on the landscaping. There were many more projects including fixing up outdoor classrooms at Tripp and Cooper Elementary Schools. I am an officer at the Gwinnett County Department of Corrections, and want to thank you for all the ‘goodies’ you sent to our facility yesterday. What an amazingly thoughtful thing for you to do. The prison is a ‘dark’, hard-hearted place, and everyday that I go there, I know I am putting myself in harm’s way. But God has a purpose for me, and for everyone else there both staff and inmates alike. Although I believe God has put me there to serve and glorify Him, it often feels as though I am going into battle alone, and it can be quite a challenge for my spirit. But last night when I saw the gifts you sent, I was reminded that I have angels and warriors joining me in battle, and I was lifted up. Graystone Church made it’s mark on our facility and became the topic of conversation. Praise God! To those of you who gave so obediently, bless you. And I encourage those who are not involved in such outreach projects to do so, because even if you are unable to reap the benefits of seeing the reactions of those on the receiving end, God sees it and blesses those good and faithful servants. Thank you again, Graystone Church, and keep up the good work. God bless you all. p.s. The rice krispy treats were ‘da bomb’! More Pics from Graystone Serves…Great seeing so many volunteers! WOW! I am so touched by the thank you letter. Sometimes I get so wrapped up in my own “service” and “ministry” that I forget about the other Christians (outside of my circle) who are doing His work in places that I am not called go. Although we are called to go into the world, it’s so neat to be reminded that we can bless our brothers and sisters too.